For the first time, the famous two cartoon characters created by Edgar P. Jacobs in 1946 will visit Hong Kong. The occasion of a stroll in 1950s Hong Kong and a unique blend of history and science fiction! 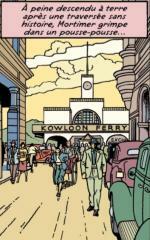 Among the news that will delight comics fans, the forthcoming release of "The Valley of the Immortals", the last episode of the saga of "Blake and Mortimer", is also to mark a milestone for the afficionados of old Hong Kong. Indeed, this new adventure takes place in the "harbour of perfumes". Even though the album is not released yet (20th December in UK), I got a first glimpse of it by reading the boards published since the end of the summer in French and Belgian newspapers "Ouest-France" and "Moustique", on the same pattern as "Tintin" magazine of the great period! Since the epidodes, the series is characterized by the mixture between historical reality and science fiction as well as a concern for details which make the cartoonist's inventions look plausible. The Belgian designer Edgar P. Jacobs often worked from photos such as for "The Necklace Affair", which takes place in Paris, "The Mystery of the Great Pyramid" in Cairo or the mythic "The Yellow M" which is located in London. The other feature is the use of uchronia, a narrative style that extrapolates official history by answering the question "What would have happened if ...?". The greatest historical invention of the father of the series is World War Three, declared and lost at the end of WWII by an imaginary Tibetan dictator, the Emperor Basam Damdu. The heroes are Captain Francis Blake, a former Royal Air Force pilot who eventually became turned the head of the prestigious MI5, and Professor Philip Mortimer, a prominent scientist in nuclear physics. The successors of Jacobs, like Yves Sente, have ever since all kept the fundamentals that made this series today's success. This episode precisely takes place after the end of World War III, the characters landing at Kai Tak airport in the late 1940s. The RAF which was stationed at Kai Tak at that time is also involved in the story when three Spitfires engage in a dogfight with a mysterious American-made Mustang. The enemy is Chinese, however, a warlord by the name of Xi-Lee, who take advantage of the chaotic situation at the end of the war together with the growing struggle between Mao and Chiang Kai-shek in China to try to get his hands on a precious manuscript. Given this threat and the push of the Communists (watch this 1949 video), Hong Kong must ensure its protection, so no need to say Captain Blake and Professor Mortimer are put to contribution. The historical part of the "Valley of the Immortals" is particularly well documented, recalling the political events which shaked these years from the very first pages of the album. Tintin fans will actually recognize a familiar character when a certain Gibbons, greets Professor Mortimer in the famous Peninsula Hotel. 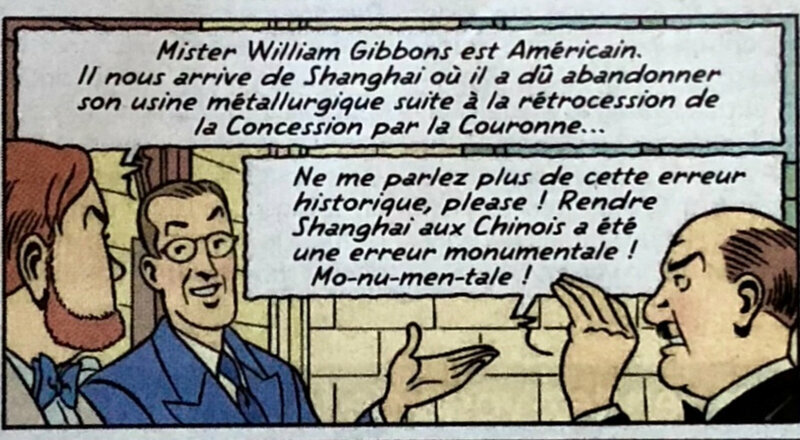 Gibbons comes from Shanghai whose International Concession has just been ceded to the Chinese authorities by the British Crown, he said and one would immediatly make a connection with the colonialist villain scorned by Tintin at the beginning of the Blue Lotus. The homage to Edgar Jacobs' career by Yves Sente is clear here as we know he worked for Hergé, Tintin's father, as a colorist. The similarity of the tones used by the two representatives of the "ligne claire" comic strip school is evident with the blushing reds and blues intended to brighten the stories published in the 1930s and 1940s. 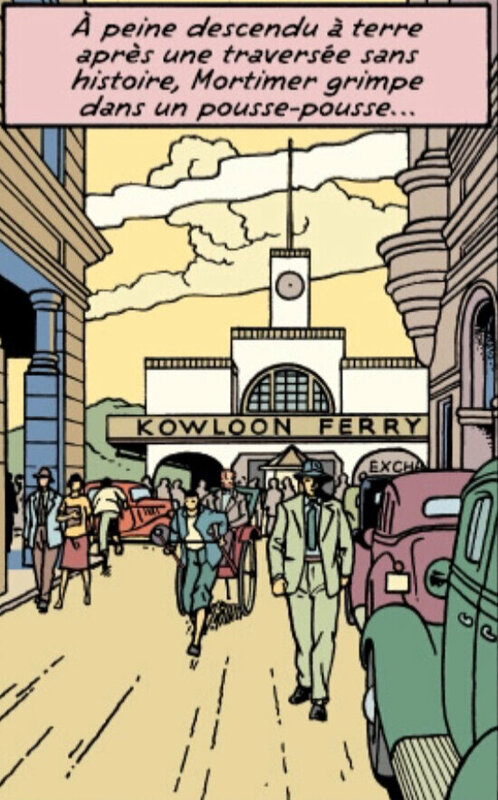 The historical parenthesis continues with a Star Ferry ride from Tsim Sha Tsui, a stopover at the Hong Kong Club and taking a rickshaw to Wan Chai, which brings another reference to Tintin's Blue Lotus album. Then the story becomes more futuristic with Professor Mortimer driving to, or may I say into, Mount Davis, near Kennedy Town. The author has indeed imagined to place a secret base of the British Army inside the mountain, supposed to protect the "free world" (remember James Bond "The Man with a Pistol Gold" and the invention of secret base hidden in the wreckage of Queen Elizabeth II). A strategic weapon is kept there, a flying guiding system for the Swordfish vessels also engineered with help of Professor Mortimer's work. Mount Davis would eventually open itself in the manner of a Cold War launching silo to release the flying engine. As I do live nearby Mount Davis, I can guarantee you that there is no such thing under the mountain. So I suggest you go there to read this comic during a hike amoong the abandoned batteries and let float your imagination. Hope to see you there after mid-November to share more Blake and Mortimer stories! Did you notice Captain Haddock sitting in the bar on page 38?